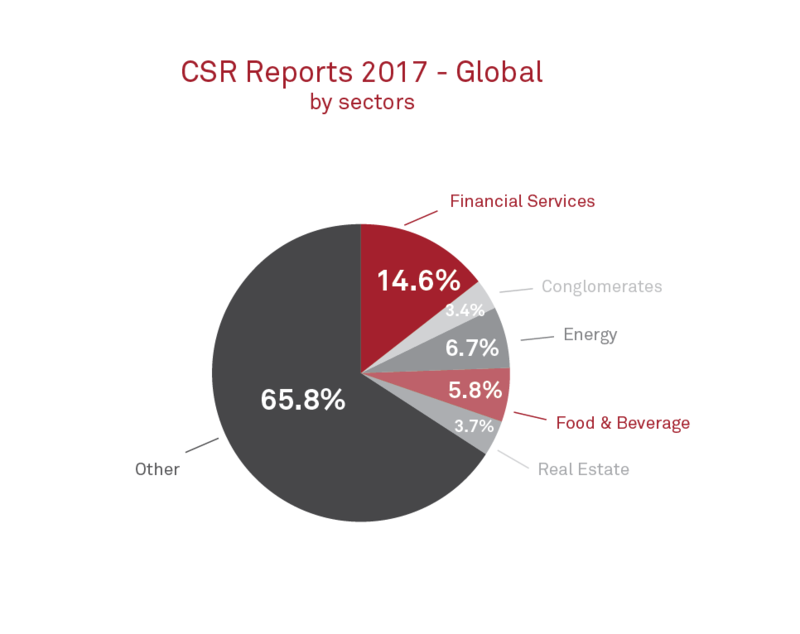 A staggering 5,000 companies and organizations uploaded their sustainability reports to the Global Reporting Initiative (GRI) database in 2017. The repository houses a collection of all sustainability reports including, but not limited to, those written using GRI’s widely-recognized international sustainability guidelines and standards. We’ve scoured the database in search of interesting data and trends. 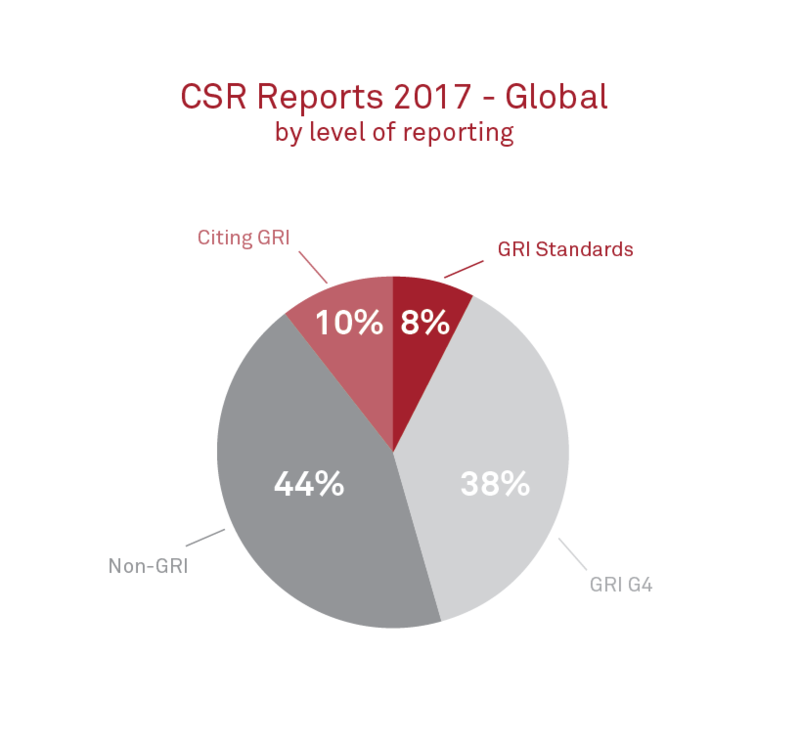 The use of GRI’s new Standards is apparent in only 8% of the reports in 2017. The majority of reports (38%) are still using GRI’s G4 Guidelines. This is quite astonishing as the latter is no longer valid after 30 June 2018. Whether the GRI Guidelines or Standards are used, it’s the Core level of adherence – as opposed to the Comprehensive one – that was more often preferred. It seems as though businesses don’t see a big advantage in publishing a report according to the more demanding adherence level. Most of the sustainability reports are produced by financial sector companies (14.6%), followed by energy (6.7%) and food and beverage (5.8%). The number of state agencies, non-governmental organizations, and universities reporting on their sustainability performance is still quite low, but constantly increasing. The EU Directive 2014/95 has been in force since the beginning of 2017. It requires that all EU companies with more than 500 employees to report transparently on their sustainability performance. More than 6,000 companies in Europe fall under this new requirements. In 2017, there was a growing demand for ESG (environmental, social, governance) data to be used in reporting, for due diligence and strategic management. In the past, the term ‘sustainability’ has been used to a similar degree as the term ‘corporate social responsibility’ (CSR). However, the balance has been tipped in favour of ‘sustainability’, owing much to the launch of the UN Sustainable Development Goals (SDGs) in 2016. New media technologies have been embraced in sustainability reporting. In recent years, reports are less likely to be printed (and with less copies when they are), and instead made available as PDFs, with some offering the option to “customise your report” by selecting and downloading only the sections or topics that are of interest to the reader. Taking this one step further, interactive reports implemented as mini-websites in HTML format with responsive infographics, short clips, games and other special features seem to be growing in popularity. The underlying objective here being to make the reports more engaging for the various stakeholder groups. If the prospect of writing a sustainability report gets your heart racing you may be glad to learn that our next newsletter will include information about the new REPORT ADVISOR tool. The tool has been created to facilitate and smooth the sometimes complex process of compiling sustainability reports according to the international standards and guidelines.